I'm a very lucky woman; my husband cooks. About a week ago, while he was making dinner, I passed through the kitchen. A freshly cut avacado sat on the counter. Thus, the inspiration for my painting--a wonderful husband and an avacado--who could ask for more? 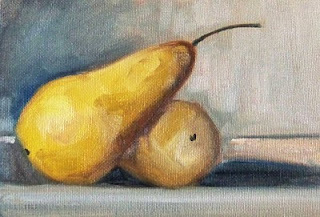 This sweet little painting is for sale at the Small Impressions Gallery. Click here to view it in the gallery and put it in your shopping cart. Today's effort requires that I praise modern transportation. Only in the days of such can I have the luxury of sitting in my warm little studio many miles north of anywhere that produces fresh lemons and paint these sunny fruits while the rain pours outside and the thermometer drops well below a temperature that would permit their growth. 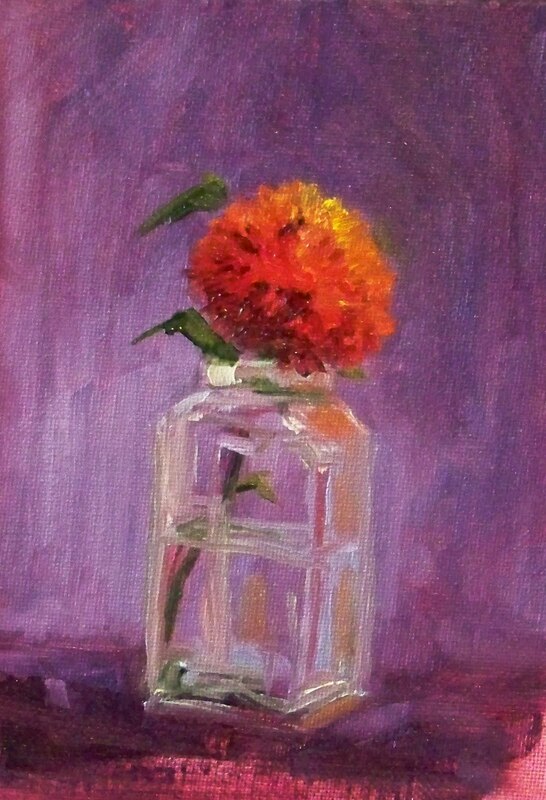 The painting is 6x8 inches on a gallery-wrapped canvas. Now that it is dry I have placed it in the Small Impressions Gallery where another winter soul can purchase its sunshine. Click here to view it in the gallery or put it in a shopping cart. A scene like this one can't be too far away. When do the spring flowers start blooming? I'm anxious. I've seen some shoots starting to peer above the soil, but they still seem quite timid. 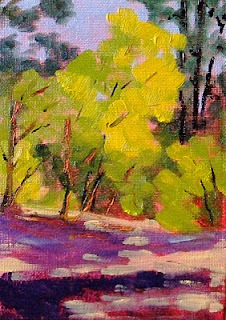 This little 5x7 inch oil painting was inspired by the upcoming spring season when a walk in the forest provides some sunny surprises. Can't wait for spring! 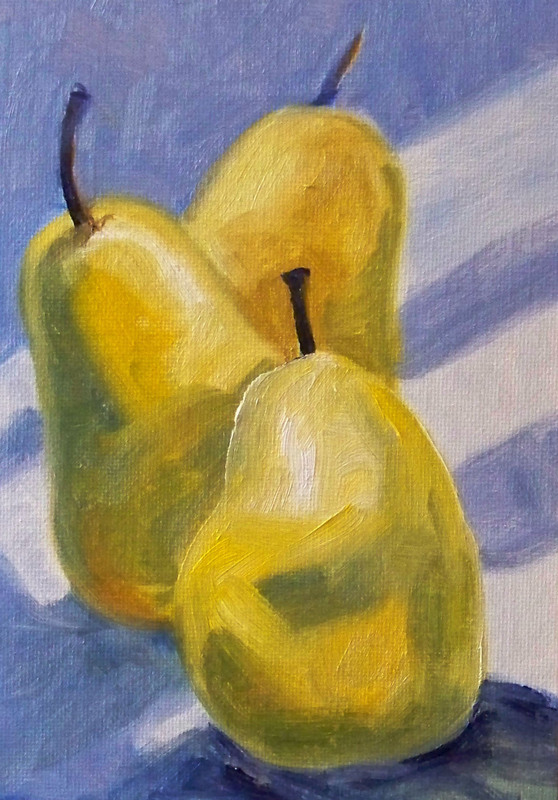 Winter weather has kept me in the studio rather than out in the world, but a trio of pears succeeded in providing some inspiration for my anxious paintbrush. When I finished the family portrait, I ate one. So sweet! 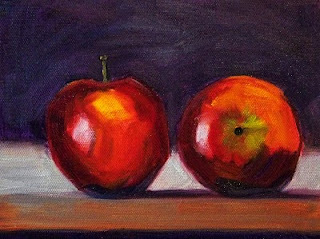 The painting is 5x7 inches on a canvas panel and will replace six other small fruit paintings that recently sold at the Small Impressions Gallery. It can be viewed in the Gallery or put in a shopping cart by clicking here. Yesterday the clouds lifted and the sun finally showed its face. I went on a long bicycle ride and it seemed like spring had finally arrived. This little bloom sprang from my imagination and my desire for the blooming time to come again. I'm not sure what, if any, kind of flower it might be, but it felt good to imagine the flowers were blooming again. The painting is 5x7 inches on a canvas panel. 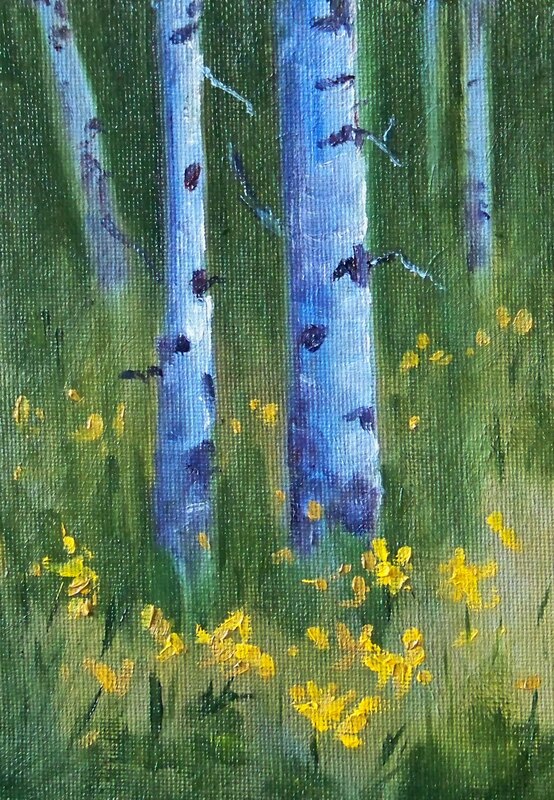 It recently SOLD at Small Impressions Paintings on Etsy. Today's painting was inspired by late summer evenings on the Pacific Coast. As the sun sets, the wet sand takes on a sparkle of the glowing sky. Sea birds pick their way along the shore and all is well. I just wish that's where we were. The winter weather is getting old and I'm ready for a vacation. 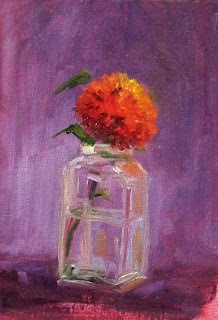 The painting is 5x7 inches on a canvas panel and has been SOLD. Check out my gallery for additional paintings currently for sale. This little lamb is in the same pasture as the goose I imagined a few days ago. 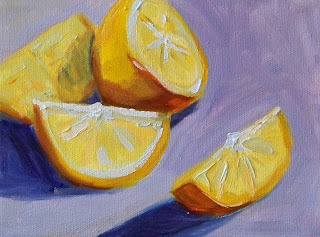 The paint is oil; the canvas is 4x6 inches. Since the paint has dried, he has joined some of the other animals at the Small Impressions Gallery. 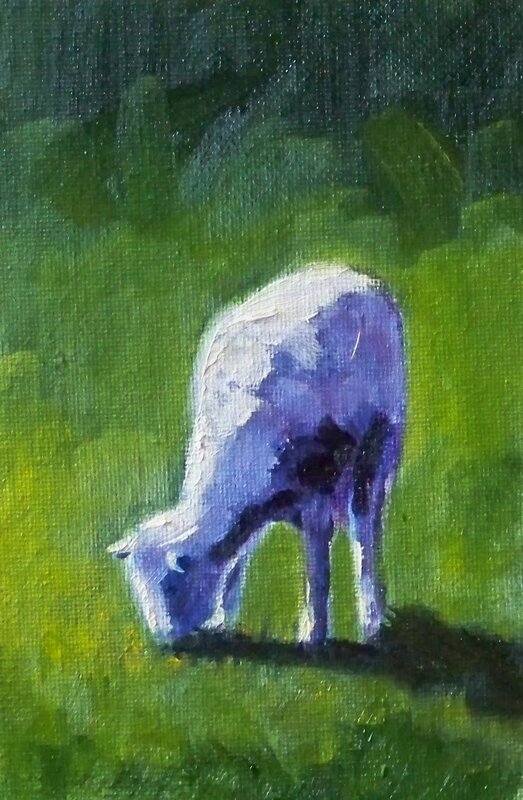 I suspect he won't be around for long; these little farm animal paintings sell quickly, giving me additional opportunites to paint more fun little creatures. He and the goose can be purchased for $24.00 each plus shipping. Click here to put this one in your shopping cart. They are a fun little pair. It was a honking good day even though the weather was bad and a leak sprang through our ceiling last night. After strategically placing a bucket in the hallway, I spent the rest of the day imagining myself walking through summer grass. This guy joined me in my imaginings, emerged from my palette, and placed himself on this 4x6 inch canvas. 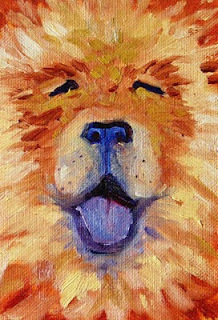 He has joined some of my other animal paintings for sale. Click here to view him in a gallery or put him in a shopping cart. My collection of reference photos is feeling sparse and fresh fruit in the middle of winter is pretty limited. Finding inspiration in in the midst of gray drizzle can be a challenge, but today these two red friends modeled for me. The painting is 6x8 inches on a gallery-wrapped canvas and the effort brought some color to this winter day. This painting can be purchased here for $65.00 plus shipping. It can also be viewed in my online gallery, Small Impressions Paintings. 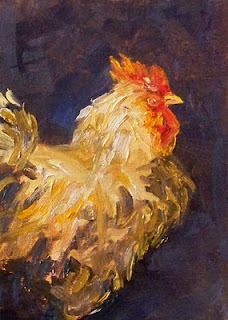 My husband likes this rooster; I think it must remind him of himself. He is the one who walks through the house at midnight checking the doors, noting the weather, and making sure we are buttoned up tight. It was fun to paint the feathers on this cocky guy--lots of texture and loose brush strokes. The painting is 5x7 inches on a canvas panel and can be purchased for $35.00 plus shipp at the Small Impressions Gallery. Click here to put it in your shopping basket. 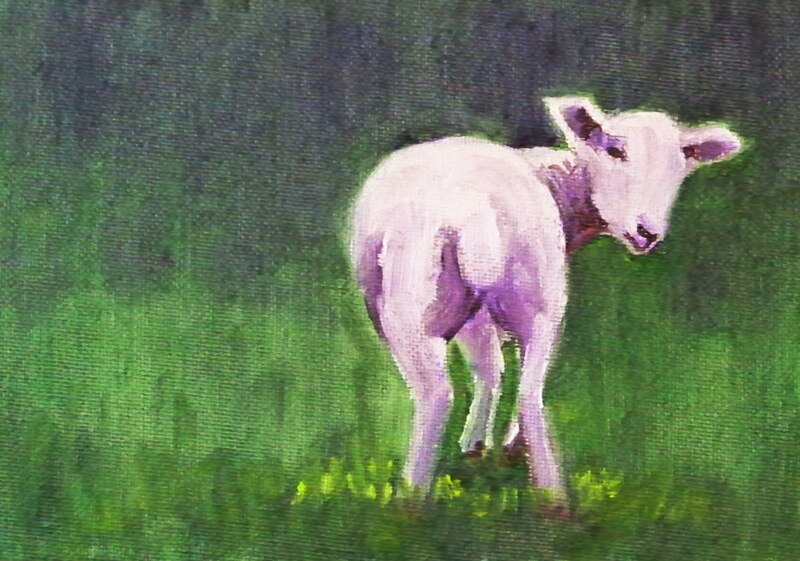 I used to paint sheep and lambs often, but had not done so for a while until recently. This little fellow is one of my recent lamb paintings. He was created on a 5x7 inch canvas panel and has joined some of my other animal paintings in the Small Impressions Gallery . He can come and stay at your house for $35.00 plus shipping if you click here. A few weeks ago I grabbed this 4x6 inch canvas and promptly made a mess. Sometimes work is better off just wiped out. After wiping the image off, the canvas sat on the shelf for a few weeks and dried. It was the color of a sunset, but there was no painting. At least until today. 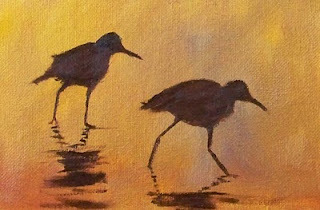 The muse visited again and these two little shore birds found a home on the golden canvas. It is satisfying when I can make something beautiful out of a dried up mess. 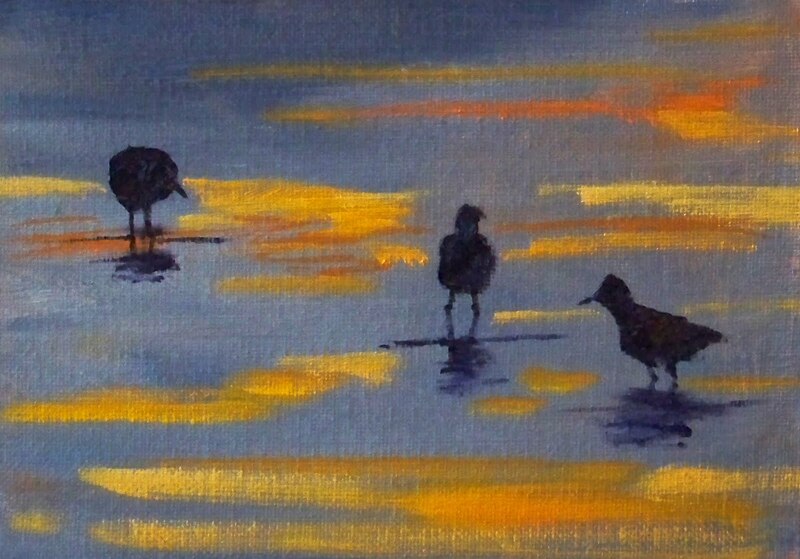 This painting SOLD at the Small Impressions Gallery , but there are other paintings of birds and animals also available here. That's me--a dog lover. I love to meet new dog friends, enjoying their personalities and their own unique doggie styles. 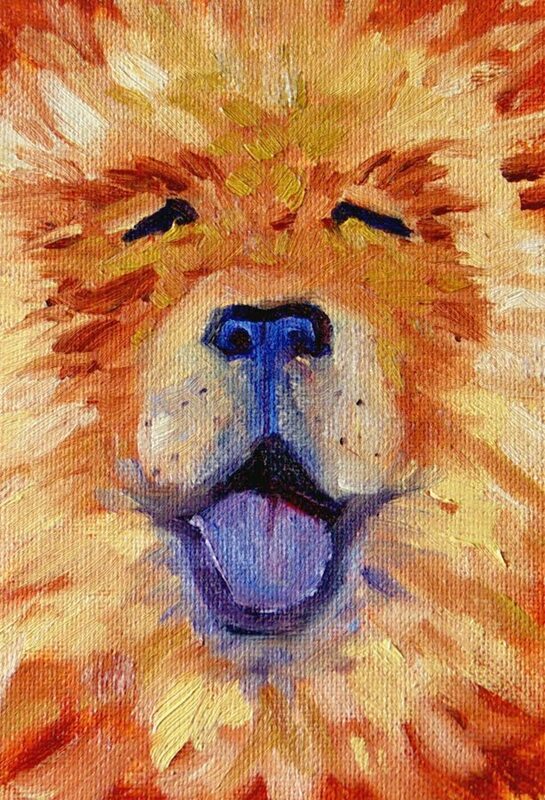 This painting was inspired by a Chow Chow I met a while back at the dog park. His name is Bernie. What amazed me was that his nose and tongue were actually blue. The blue in my painting isn't just an artistic choice. His features were actually blue. 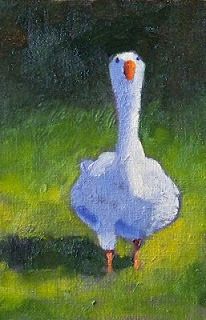 The painting of Bernie has SOLD, but there are more paintings of birds and animals at the Small Impressions Gallery. 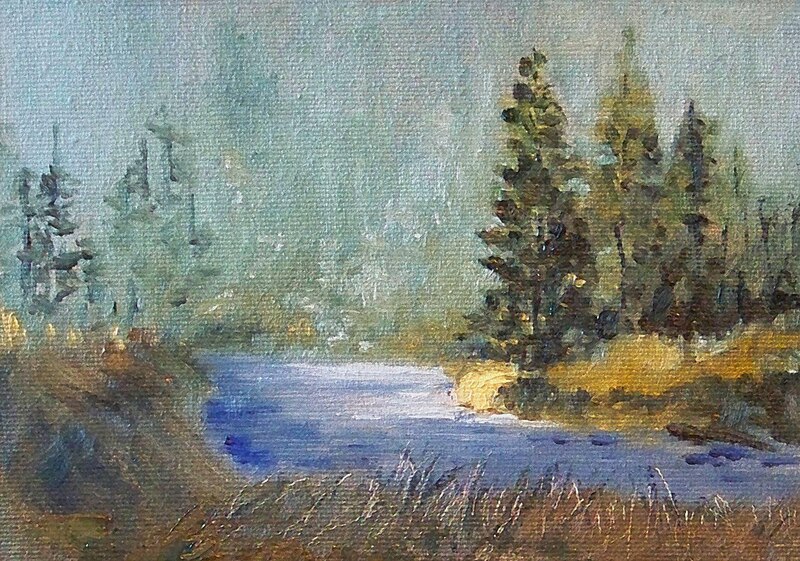 When I painted this 5x7 inch oil painting, I was trying to capture one of those brief moments when the sun twinkles through the fog and gives viewers a glimpse of sunlight. Winter fog is common in this part of the country which makes those little glimmers of sunlight that much more important. Again, wishing for sunshine. It has been a long time since I've used a red wash as an underpainting for a landscape. Red used to be a common color for my landscapes in the past, but in my quest to experiment with new combinations, red has been neglected recently. I have a large tube of Gamblin Napthol Red that seldom gets much traction because it is such a powerful red. However, I love the way it worked under this little 5x7 inch painting inspired by a photo I took last spring. I just keep dreaming of warm weather. Now that it is dry, it is for sale at the Small Impressions Gallery at Etsy for $35.00 plus shipping. Click here to view it in the gallery or put it in a shopping cart. Yesterday I went to the Picasso Exhibit at the Seattle Art Museum. Picasso has never been much of an influence on my work, but it was an opportunity I didn't want to miss. Seeing the work of famous artists in person is a very different experience than viewing online or in books. I like to see the brush strokes and textures up close and note the materials. 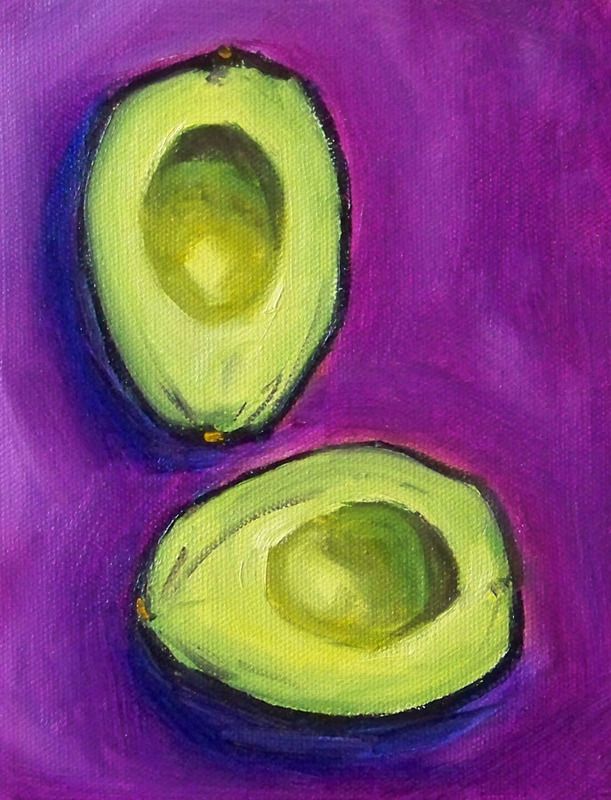 Today's painting was influenced by Picasso's subdued colors, carnal ideas, and womanizing ways. The painting can be purchased online here for $35.00 plus shipping.